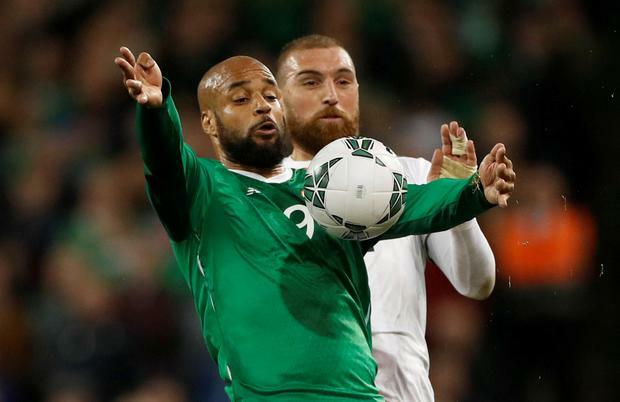 David McGoldrick declared the standing ovation he received from the Aviva Stadium crowd after his battling performance in Ireland's 1-0 win against Georgia was one the proudest moments of his career. McGoldrick was overlooked by former Ireland manager Martin O'Neill in the final months of his tenure as Ireland boss, but he confirmed his worth with a committed display that saw him named as man-of-the-match after a tireless effort leading the line. "It was very touching to get an ovation like that," declared McGoldrick. "I haven't had an ovation like that for a long time. To play for Ireland, my country, and get an ovation like that was one of the proudest moments of my career. "I played under the gaffer for five-and-a-half years in that role and I know what he wants. You need to run and work hard to get into his team, so I knew what I had to do. I felt like a did a good job to help the team get a win. "It was a great performance, a proper team performance. Georgia are a good team and we needed to work as a team to get the win and finish off a good week." Former Ireland striker Jonathan Walters saluted the performance of lone striker McGoldrick, as he made a positive impact in Ireland's 1-0 win against Georgia. Sheffield United striker McGoldrick earned a rousing ovation as he was replaced by Matt Doherty eight minutes from time, with Walters leading the acclaim for the 31-year-old striker. "The theme we will see in this qualifying campaign is Mick playing with one up front and David McGoldrick put a great shift in. He deserved a goal on that performance. "It's very difficult to play that role one up front and he ran himself into the ground. I'm not surprised to see him doing this. To have him playing like that for every game would be a massive plus for us. "This was a good all-round good performance. The three midfielders played really well tonight, they contained Georgia and passed the ball well.